Many sensitive, empathic people have not learned how to self-soothe if they are upset or when life gets intense. Like many children, perhaps you didn’t have the kind of parents that held you and let you know that everything was going to be okay. If your parents were anxious they also may have transmitted their anxiety to you. Sensitive children can absorb this and may unknowingly carry it around as an adult. 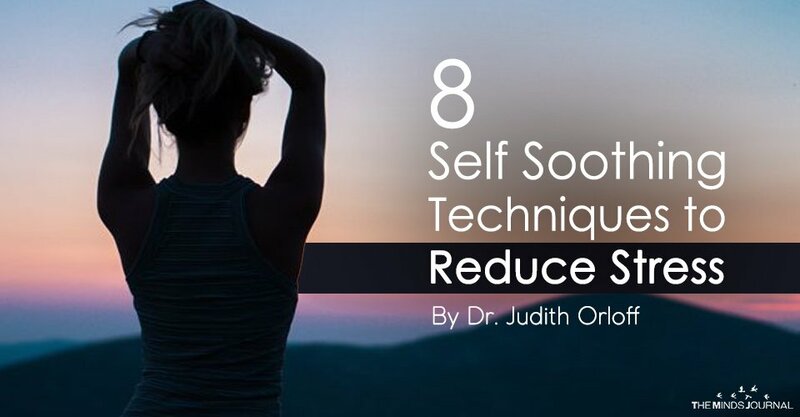 To take charge of your emotions, practice the self-soothing techniques below to prevent getting overloaded by the stress of the world or your internalized stress. Using these strategies from my book The Empath’s Survival Guide: Life Strategies for Sensitive People will help you stay calm and centered. As soon as stress hits, immediately take a few deep, slow breaths. Breathing helps you expel tension so it doesn’t lodge in your body. Tell yourself, “This is a transient situation. I will find the best way of handing this. Everything will be okay.” Do not let negative, fear-based voices get in the way of consoling yourself with kindness. You are larger than fear. You are larger than anxiety. When you notice yourself getting stressed or overwhelmed tell yourself, “I am not this emotion. I can center myself. I can lovingly detach from my state of overwhelm and lovingly witness the feelings I’m experiencing. Realizing you are larger than the feeling, will relax you and offer you perspective. Keep reminding yourself that everyone deserves the dignity of walking their own path. This will help you avoid feeling inappropriately responsible for what others are going through. Picture divine white light coming though the crown of your head and darkness flowing out the bottom of your feet. This reduces overwhelm by keeping energy flowing out of your body. 6. Use lavender essential oil. Inhale lavender essential oil or put a few drops midway between your eyebrows (on your third eye) to calm yourself. Just as mothers console their babies by patting their chest, you can put your hand over your heart to calm yourself. The heart are in the mid-chest is the center for unconditional love. When you touch it, love will be activated and start send blissful biochemicals called endorphins throughout your body. Your thoughts make a difference. Be sweet to yourself whenever possible—avoid beating yourself up. Remember to show yourself compassion when you’re stressed or emotionally distraught. Replacing negative thoughts with positive ones enhances your well-being. Being an empathic, caring person leaves you open to a wide range of feelings. When you sense love and joy, you will experience well-being. However, picking up negative emotions can be agitating. As part of your self-care, you want to keep yourself as calm as possible. Using the techniques I discussed will help create more equanimity and peace in your life.